Will Watch: a tale of the coast. The narrative founded on fact, and characters drawn from life . London: W. M. Clark. 47 nos. 380 p.
Kathleen; or, the secret marriage . London: E. Lloyd, . 80 nos. 636 p.
J. F. Smith , Esq. The Young Chevalier; or, the wars of the Guelphs and Stuarts . London: E. Lloyd, [c. 1851]. 20 nos. 158 p.
Charles Rabou. The Widow's Walk; or, the mystery of crime . "Roscoe's library edition". London: E. Appleyard. 19 nos. 152 p.
Renton Nicholson. Cockney Adventures and Tales of London Life . London: W. M. Clark and A. Forrester, 1838. 21 nos. 168 p.
Pierce Egan. Wat Tyler . London: [W. S. Johnson], 1851. 64 nos. 510 p.
George W. M. Reynolds. Faust: a romance of the secret tribunals . London: G. Vickers. Paris: A. and W. Galignani. 28 nos. 218 p.
George W. M. Reynolds. Wagner, the Wehr-Wolf. A romance . London: J. Dicks, 1857. 24 nos. 192 p.
Eugene Sue. The Female Bluebeard: or The Adventurer . London: W. Strange, 1845. 20 nos. 306 p.
Gabriel Alexander. Wallace: the hero of Scotland . London: John Dicks. 34 nos. 284 p.
George W. M. Reynolds. The Coral Island; or, the hereditary curse . London: John Dicks, 1854. 39 nos. 308 p.
George W. M. Reynolds. The Bronze Statue, or, the virgin's kiss . London: John Dicks, 1855. 367 p.
George W. M. Reynolds. 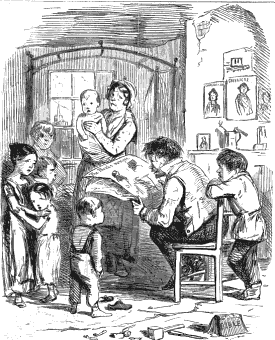 The Seamstress; or, the white slave of England . London: John Dicks, 1853. 17 nos. 134 p.
George W. M. Reynolds. Kenneth: a romance of the Highlands . London: John Dicks, 1856. 47 nos. 376 p.
George W. M. Reynolds. The Massacre of Glencoe . London: John Dicks. 43 nos. 339 p.
George W. M. Reynolds. May Middleton; or, the history of a fortune . London: John Dicks, 1858. 17 nos. 136 p.
George W. M. Reynolds. Omar: a tale of the war . London: J. Dicks. 40 nos. 324 p.
George W. M. Reynolds. Leila, or, the star of Mingrelia . London: John Dicks. 25 nos. 200 p.
George W. M. Reynolds. Master Timothy's book-case; or the magic lanthorn of the world . London: [James Gilbert], 1847. 24 nos. 373 p.
Mary Price; or, the memoirs of a servant-maid . Vol. 1. London: John Dicks. 52 nos. 414 p.
Mary Price; or, the memoirs of a servant-maid . Vol. 2. London: , 1853. 206 p.
George W. M. Reynolds. The Empress Eugenie's Boudoir . London: John Dicks, 1857. 41 nos. 323 p.
The Young Duchess; or, memoirs of a lady of quality. A sequel to "Ellen Percy." . London: John Dicks, 1858. 52 nos. 415 p.
Joseph Wilmot; or, the memoirs of a man-servant . Vol. 1. London: John Dicks. 52 nos. 415 p.
Joseph Wilmot; or, the memoirs of a man-servant . Vol. 2. London: John Dicks. 52 nos. 413 p.
Paul Periwinkle: or, The Pressgang . London: Willoughby & Co. 640 p.
George W. M. Reynolds. The Necromancer . London: J. Dicks. 33 nos. 264 p.
The Life and Adventures of Valentine Vox The Ventriloquist: . London: Willoughby & Co. 620 p.
Alfred: or, the adventures of a French gentleman . London: Henry Lea. 30 nos. 237 p.
Adventures of Old Dan Tucker, and his son Walter; a tale of North Carolina . London: Willoughby & Co. 222 p.
Léger-St-Jean, Marie. Price One Penny: A Database of Cheap Literature, 1837-1860 . [12 July 2018]. Faculty of English, Cambridge [20 April 2019] (http://priceonepenny.info).